Bus from Kuala Lumpur to Tanjung Gemok is one of popular tourist bus route besides serving the locals. Tanjung Gemok is one of the gateway town to the famous tourist hotspot, Tioman Island. Many tourists prefer to take ferry from Tanjung Gemok jetty to Tioman Island because the ferry schedule is more stable compared to Mersing jetty. Tanjung Gemok is the jetty name in the Endau town. Therefore, some especially locals are also referring the Tanjung Gemok as Endau. Sepakat Liner Express is the only reliable brand offering bus from Kuala Lumpur to Tanjung Gemok. Their combined trips have total 10 daily departures from Kuala Lumpur to Tanjung Gemok. Sepakat Liner Express is the largest player for this bus route providing 6 daily departures while Sanwa Express provides 4 daily departures. The first bus starts at 4am. Then the following bus schedules are 9am, 11am, 3pm, 5.45pm, 9.30pm, and 11pm. 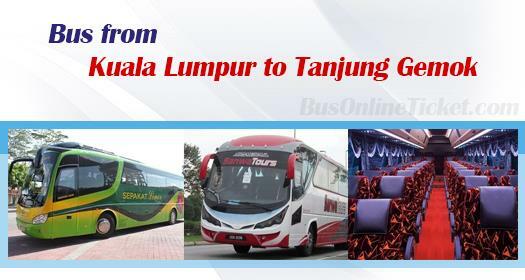 The duration required for bus from Kuala Lumpur to Tanjung Gemok is takes about 5 hours depending on traffic condition. The bus fare from Kuala Lumpur to Tanjung Gemok is charged in the range of RM 30.90 – RM 39.00 depending on the choice of bus operator. At least 1 washroom break will be provided during the journey because all coaches in Malaysia do not come with toilet facility. The deparutre point in Kuala Lumpur is at Terminal Bersepadu Selatan (TBS). Terminal Bersepadu Terminal Selatan (TBS) is a transport hub in Kuala Lumpur. The coach going to Tanjung Gemok (or Endau) provides a convenient jetty drop-off point at Tanjung Gemok Jetty located at Endau. Passengers arriving at Tanjung Gemok Jetty can take ferry from there to Tioman Island. Want to have a short staycation in Tioman Island? You can book your bus ticket online now from our official website BusOnlineTicket.com or via mobile app which can be downloaded for free on App Store or Google Play just a fingertip away.